The Wildcats’ bench cheers as Weber State defeated Oral Roberts 62-61. 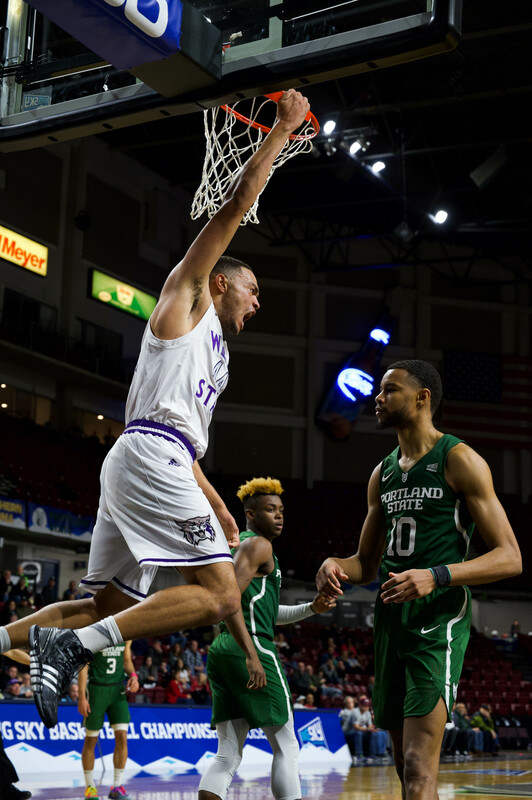 In a physical match, the Weber State men’s basketball team was able to overcome a six-point deficit late in the second half to beat Oral Roberts University 62-61 at the Dee Events Center Monday night. The first half was a slow start for the Wildcats, who—despite a strong effort—trailed the Golden Eagles for the majority of the half before putting forth a strong effort and bringing the game to a 24-24 tie. Sophomore guard Richaud Gittens hit a long three-point basket as time expired to tie the game. His shot later ended up on ESPN’s SportsCenter Top 10 Plays. After trailing through most of the second half, the Wildcats were able to bring themselves within one point of the Golden Eagles. The Eagles fought back and jumped ahead of the Wildcats to take a 60-54 lead with 59 seconds left. The Wildcats were able to over come the deficit and during a rebound off of a Weber State free throw, Senglin was able to repeat his game-winning shot against Nevada and seal the deal for the Wildcats with a three-point shot coming with two seconds left in the game. Gittens led the team in scoring with 16 points overall. He had one of his best shooting performances of the season, shooting 5-for-8 from the field and a perfect 4-for-4 from three-point range. The Wildcats now sit at 3-3 on the season and will continue play this week going on the road to University of Texas-Arlington (3-3) on Saturday. The Wildcats will then return home to face in-state opponent BYU on Dec. 13 at 7 p.m. Tickets start at $8 for the general public and admission is free for the student body.